[/caption]During the 19th century, one of the greatest discoveries in the history of physics was made by an Scottish physicist named James Clerk Maxwell. It was at this time, while studying the perplexing nature of magnetism and electricity, that he proposed a radical new theory. Electricity and magnetism, long thought to be separate forces, were in actuality closely associated with each other. That is, every electrical current has associated with it a magnetic field and every changing magnetic field creates its own electrical current. Maxwell went on to express this in a set of partial differential equations, known as Maxwell’s Equations, and form the basis for both electrical and Magnetic Energy. In fact, thanks to Maxwell’s work, magnetic and electric energy are more appropriately considered as a single force. Together, they are what is known as electromagnetic energy – i.e. a form of energy that has both electrical and magnetic components. It is created when one runs a magnetic current through a wire or any other conducive material, creating a magnetic field. The magnetic energy generated can be used to attract other metal parts (as in the case in many modern machines that have moving parts) or can be used to generate electricity and store power (hydroelectric dams and batteries). Since the 19th century, scientists have gone on to understand that many types of energy are in fact forms of electromagnetic energy. These include x rays, gamma rays, visible light (i.e. photons), ultraviolet light, infrared radiation, radio waves, and microwaves. These forms of electromagnetic energy differ from each other only in terms of the wavelength and frequency. Those forms which have shorter waves and higher frequencies tend to be the more harmful varieties, such as x-rays and gamma rays, while those that have longer waves and shorter frequencies, such as radio waves, tend to be more benign. In mathematical terms, the equation for measuring the output of a magnetic field can be expressed as follows: V = L dI/dt + RI where V is volume, L is inductance, R is resistance, I is charge, dI represents change in charge, and dt represents change over time. Here are some articles about Magnetic Energy written for Universe Today. Magnets are the unsung heroes of the Modern Age. However most people don’t really understand what are magnets made of and how they even work. The issue is that we just know that magnets attract iron and nickel. However, magnets have a very interesting origin and can be seen as a physical manifestation of the electromagnetic force. All magnets are made of a group of metals called the ferromagnetic metals. These are metals such as nickel and iron. Each of these metals have the special property of being able to be magnetized uniformly. 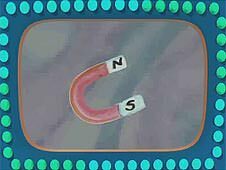 When we ask how a magnet works we are simply asking how the object we call a magnet exerts it’s magnetic field. The answer is actually quite interesting. In every material there are several small magnetic fields called domains. Most of the times these domains are independent of each other and face different directions. However, a strong magnetic field can arrange the domains of any ferromagnetic metal so that they align to make a larger and stronger magnetic field. This is how most magnets are made. The major difference among magnets is whether they are permanent or temporary. Temporary magnets lose their larger magnetic field over time as the domains return to their original positions. The most common way that magnets are produced is by heating them to their Curie temperature or beyond. The Curie temperature is the temperature at which a ferromagnetic metals gains magnetic properties. Heating a ferromagnetic material to its given temperature will make it magnetic for a while. While heating it beyond this point can make the magnetism permanent. Ferromagnetic materials can also be categorized into soft and hard metals. Soft metals loses their magnetic field over time after being magnetized while hard metals are likely candidates for becoming permanent magnets. Not all magnets are manmade. Some magnets occur naturally in nature such as lodestone. This mineral was used in ancient times to make the first compasses. However, magnets have other uses. With the discovery of the relation between magnetism and electricity, magnets are now a major part of every electric motor and turbine in existence. Magnets have also been used in storing computer data. There is now a type of drive called a solid state drive that allows data to still be saved more efficiently on computers. We have written many articles about magnets for Universe Today. Here’s an article about the Earth’s magnetic field, and here’s an article about the bar magnet. If you’d like more info on Magnets, check out NASA’s Discussion on Magnets, and here’s a link to an article about Magnetic Fields. The short version: electromagnetism is one of the four fundamental forces (the strong force, the weak force, and gravitation are the other three), responsible for all magnetic, electrical, and electromagnetic phenomena. The long version is a little more complicated. Start with history … phenomena we today call electrical have been known for millennia (e.g. static electricity), as have their magnetic counterparts (e.g. lodestone). The 17th and 18th centuries saw considerable scientific study of each, as separate forces, with Ørsted and Ampère uniting the two into electromagnetism, around 1820. Maxwell consolidated (in 1864) everything known about electromagnetism into what today we call Maxwell’s equations … and predicted electromagnetic waves (or radiation), a prediction verified by Hertz, two decades later. However, Maxwell’s equations opened a can of worms (to do with the aether, and the speed of light) … which lead to Einstein and special relativity. In parallel, a series of discoveries lead to photons (the quanta of electromagnetic radiation) and quantum mechanics, and these in turn to the recognition that the spectacular success of classical electromagnetism (i.e. Maxwell’s equations) actually depends on quantum field theory (with all its counter-intuitives). Fast forward to the 1940s, and Quantum Electrodynamics (QED), which has electrically charged particles interacting via exchanges of photons (real or virtual), and describes all electromagnetic phenomena. QED is the most successful theory in physics, period (it has been tested, and found accurate, to one part in 1012!). Here’s a fun fact: QED incorporates special relativity … and an electric charge (with no magnetic field) becomes an electric current (with an associated magnetic field), in relativity, simply by switching to a frame of reference moving with respect to the (stationary) electrical charge. So, in its classical form, electromagnetism is an instantaneous ‘action at a distance’ type of force; in its quantum form; it’s an exchange of virtual photons, at the speed of light. In 1979 Sheldon L. Glashow, Abdus Salam, and Steven Weinberg shared the Nobel Prize for Physics, for their contributions to the unification of electromagnetism and the weak force … which goes under the name electroweak interaction. So electromagnetism is just one manifestation of something more general, just as electricity and magnetism are two manifestations of one underlying thing, electromagnetism. Want to learn more? Try Stargazers’ Electromagnetism, Math Pages on Maxwell’s equations, Richard Feynman’s excellent non-technical book on QED, and the 1979 Nobel Press Release on the electroweak interaction. Magnetic “Ropes” Connect the Northern Lights to the Solar Wind, and Spitzer Spies Ghostly Magnetar. Astronomy Cast has an episode devoted to electromagnetism, called Electromagnetism. Some others you may also find interesting, on this topic, are The Search for the Theory of Everything, and The Important Numbers in the Universe.